In December, Paris Club creditor nations hammered out a debt restructuring deal with the island government, which forgives a large portion of monies owed from a default in 1987, while the Cuban government committed to paying off the rest over time. 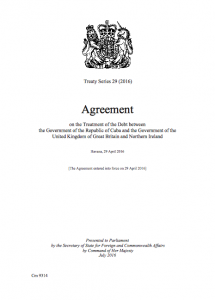 In its April 29 deal with the United Kingdom, for instance, Cuba committed to paying £62.8 million ($82.5 million) of principal and interest through 2033, in annual installments due Oct. 31 each year, beginng with a $1.33 million payment this fall. This, in return for the UK pardoning £139.2 million ($183 million) in late interest. If Cuba misses any payment after a 45-day grace period, interest will rise from 1.5% to a stiff 9%, according to the agreement. Observers cite these kinds of deals as evidence that the Cuban government is serious about integrating itself fully into the global economy, but some are wondering if the island’s current liquidity crisis will compel it to fall back on its debt service promise. Economist Pavel Vidal is arguing that, in the face of the cash crunch, Cuba will have to take drastic measures to maintain its commitments with international creditors, as the worst for Cuba’s economy is yet ahead. “In 2016, the Cuban authorities can soften the shock by using up inventories of available raw materials and consumable goods and postpone payments, but in 2017 they will have to make much bigger adjustments in spending,” the former Central Bank economist argues in an upcoming Cuba Standard Economic Trend Report. Vidal says that Cuba’s challenge is to avoid another “corralito financiero” (financial playpen), as the freezing of hard-currency bank accounts in 2008-2009 has been dubbed. Due to these kinds of economic forecasts, the international financial community is preparing for the worst with Cuba. However, the same source pointed out it’s remarkable that, despite the bad news, international trading partners and creditors are staying the course with Cuba. Expectations of greater U.S. investment in the Cuban economy are cited as a factor. One such example is the Italian export credit agency SACE. Despite Cuba’s economic crisis, SACE CEO Alessandro Decio proceeded to signing a debt swap agreement with the island’s government on July 12, converting €88.6 million of commercial debt that Cuba owed SACE into a fund for strategic development projects involving Italian companies and Italian-Cuban joint ventures. That agreement followed a multilateral accord reached between the Paris Club and Cuba last December, which called for the restructuring of €441.4 million in medium and long-term debt owed to SACE. A SACE press release issued after the signing of the agreement asserts that Cuba still is a viable market for Italian exports. 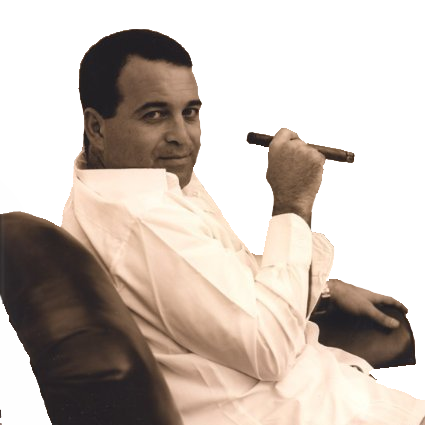 One Italian businessman who took part in a recent trade mission to Cuba shares this attitude. “I don’t think Italian firms will stop (doing business with Havana), because they are very interested, and believe that now is the time to approach the Cuban market,” said Nicola Cecchi, a Florence-based lawyer who is president of the Italian-Cuban Chamber of Commerce, in a recent email to Cuba Standard. In a separate press release, SACE reasoned that Cuba’s reforms, “which introduced tax benefits for foreign investors and reduced the obstacles to machinery imports into the country, have made Cuba a market with growing opportunities for Italian export, but where operating and commercial risk remain high.” SACE mentioned that in 2015, Italian exports rose 45% to €330 million, with an excellent outlook for this year. The Italians are following the Spanish government’s footsteps, whose export credit agency COFIDES S.A. already offers medium and long-term credit insurance coverage through a Cuba Financing Facility. With an endowment of €40 million, that facility is mandated to drive productive and commercial deployments on the island and in the Special Economic Development Zone of Mariel. In July, for example, it provided Madrid-based electrical equipment distributor Promael Group with €250,000 for a venture in Cuba. Blazing a path for more such investments, a Spanish delegation was in Havana in July to discuss how to use a €415 million ($465 million) project fund converted from old debt to encourage Spanish investments in Cuba. Meanwhile, despite the liquidity crisis, Cuba continues to strike bilateral deals over its defaulted public debt at a brisk pace. Italy aside, just within the last four weeks Cuba negotiated debt agreements with Sweden, Denmark and Finland. Given the positive dynamic evolving from the renegotiation of its old public debt, the British investment consultant suggests that Cuba should seek a deal for its defaulted commercial debt as well. This entry was posted on Saturday, August 6th, 2016 at 2:50 pm	and is filed under Economy. You can follow any responses to this entry through the RSS 2.0 feed. Both comments and pings are currently closed.